Preface: I am not a scientist, I am not an economist, but, I am a systems thinker and see how the current economic system is not working in an efficient and sustainable manner. Like-minded people have gotten together and are now working on new thoughts about a world economy that will work in today’s fast paced culture. This is a very short depiction of an idea. The Economic System we are in now is extremely outdated. It is based on labor hours and a need to create scarcity. It is sustained through a constant need to increase our purchasing and add to our debt balance. 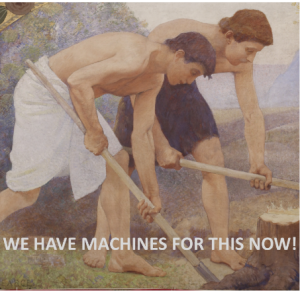 The system did work for thousands of years when it was based on the metrics of 98% human labor providing goods and services and 2% using extraneous energy or “other than” human labor. That system doesn’t work any longer; currently, ~ 98% of all labor and services use extraneous energy. Our economy also is theoretically based on a Gold Standard. But, how much of the currency in circulation is truly backed by gold or tangible resources, how much is fiat-backed, only there because someone says it is? There are many intelligent, resourceful people from all areas of the world, all types of outlooks, businesses, sciences, and cultures working on a New Economic System. I have done much research on what is available to laypeople such as myself. What I haven’t seen so far, is a company or an organization currently working a simple system such as Technocracy has designed that would set standards that consider the impact and effect on society and the environment. 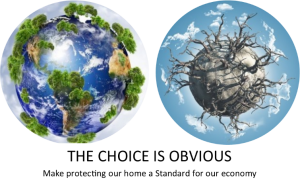 What if we arrange the economy so there is not a Gold Standard, or a Resource/Commodity Economy, or a Fiat Economy, but an Environmental-Societal Impact Standard Economy? Could we still have a global economy? Yes. If impacts on society and the environment become the main standards for an economy, there will be swift and positive changes. 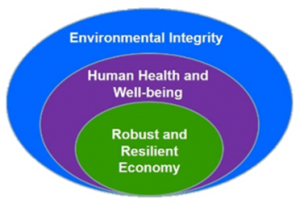 Businesses that have minimal, or positive, impact on the environment and society will become the leaders in the economy; and businesses that pollute, or have a negative effect on society will be at the lower end of the economy. The term ‘Profit based’ will become synonymous with positive impact rather than the current import (often) denoting negative / harmful impacts on society and / or the environment. If we adjust the criteria for the economy, positive changes would happen very quickly. The companies that have funding resources would want to continue to have a profit and would adjust their business practices quickly to include these standards and eventually become more sustainable. This could also be taken down to an individual level. A person who lives in a proven sustainable manner could get a large environmental tax credit. Fiscal benefits motivate many people in a way that being told they are “helping the environment” doesn’t. There has been research done regarding the metrics, determinants, and components of those standards. What value to set on zero carbon footprint, what value to set on massive oil spills. How will impact on our societies be measured and valued? These are questions that still need to be researched. Is the world ready for a system that would value long-term societal and environmental thinking over short-term gain? Are we ready to admit that scarcity is not a reality? Do we see that with using only the technology currently available that the world has the ability to care for every person on earth? Are we willing to stop using a system of Labor for Dollars and replace it with Societal Input for Sustainability? Do you want your child taken care of in the best way possible? To be nurtured, taught to think for themselves, taught how to get along with others? Of course you do! What if a child care worker’s societal service (societal input) was valued as highly as a doctor, an engineer, a pilot? Would you not feel safe and comfortable knowing that the people who are taking care of your children have their best interests at heart and mind? Although many childcare employees are wonderful and love children, sadly, there are many childcare workers who are people who cannot get any other jobs and are there to get a paycheck and ‘be a body’ to comply with federal standards. What if your service station was not rewarded based on how many new (often irrelevant) services that they sold to you, but on how well they performed the job and the environmentally impact of their practices? Would society be different if customer service was real and based on how well they handle customers using a positive and mediation-style of communication. Instead of remuneration based on hours worked and services sold, they were rewarded based on how well their services / products impacted society and the environment. How will the Environmental Economy be set up? And You can help with this! What metrics do you feel would be best, how should we measure societal and environmental impacts? What would be the best way to transition to a long-term environmental and societal sustainable economy?